The Graduate Certificate in Digital Literacy is a 12-credit blended learning graduate program that enables educators, librarians and media professionals to acquire the knowledge, skills and competencies required for full participation in a read/write culture where active participation in a knowledge community requires the skillful use, creation and sharing of digital texts, tools and technologies. Learn what the first cohort of digital literacy graduates has to say about the program. The U.S. Department of Education recognized the URI Graduate Certificate Progam in Digital Literacy in the 2016 "Future Ready" National Educational Technology Plan. Advance your expertise in digital literacy and become a leader in the field! Cultivate habits of mind that support an expanded conceptualization of literacy as it applies to digital media environments, including tenacity, reflection, creativity, flexibility, and lifelong learning. The program is co-sponsored by the URI School of Education and the Media Education Lab. The program was formally approved by the State of Rhode Island and was officially accredited by the New England Association of Schools and Colleges in 2014. The University of Rhode Island's online programs are accredited by the National Council for State Authorization Reciprocity Agreeements (SARA). 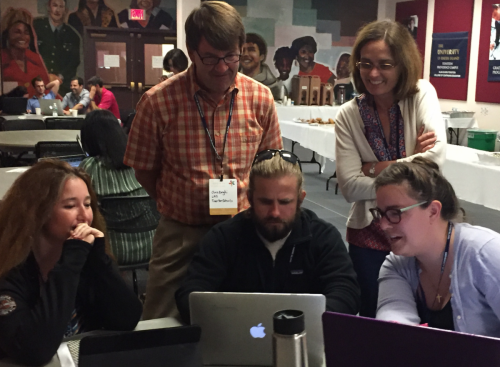 In the Summer of 2020, the Summer Institute in Digital Literacy moves to Chicago, Illinois! Thanks to a partnership with National Louis University, students will have access to low-cost dorm facilities right in the downtown Loop! EDC 531: Teaching and Learning with Digital Technologies. Taught as the SUMMER INSTITIUTE IN DIGITAL LITERACY, students are engaged in project-based inquiry using a variety of digital tools to create challenging and engaging learning opportunities for others. 3 cr. Face-to-Face. SUMMER. EDC 532: Seminar in Digital Literacy and Learning. Taught as a fully-online course, this course focuses on understanding major theories of online and offline reading comprehension, how to assess online reading, and productive ways of teaching digital literacy skills in grades K-12. 3 cr. Online. FALL. EDC 534: Seminar in Digital Authorship. This fully online, open-network learning enrvironment course includes a range of hands-on dynamic learning experiences that integrate digital media, technologies, and best practice strategies for teaching mutlimedia composition and authorship in a Web 2.0 world. 3 cr. Online. SPRING. EDC 535: Leading with Digital Literacy. Taught as the face-to-face SUMMER INSTITUTE LEADERSHIP TIER as part of the SUMMER INSTITUTE IN DIGITAL LITERACY, this course focuses on leading and collaborating to support digital literacy and facilitate real and sustainable change in a range of educational contexts. 3 cr. Face-to-Face. SUMMER. EDC 531: Teaching and Learning with Digital Technologies. SUMMER INSTITUTE IN DIGITAL LITERACY. EDC 532: Seminar in Digital Literacy and Learning. ONLINE. Prof. Coiro. EDC 534: Seminar in Digital Authorship. ONLINE. Prof. Hobbs. EDC 535: Leading with Digital Literacy. LEADERSHIP TRACK, SUMMER INSTITUTE.